The best free RSS readers for Windows | ComTek Computer Services Inc.
As is the case with many tools out there, I prefer a desktop RSS reader over an online solution. Sure, online services such as Feedly have advantages. You can access them for instance from any Internet capable device and they require less space than local solution. On the downside, you depend on the service. If it goes down, has a bug or decides to become paid only, you may not be able to access the service for the time being or ever again. Desktop RSS readers work similar to mail clients. You add one or multiple feeds to them and whenever you start them, see which sites have published new posts. These information are stored in a local database so that you can access past records even without Internet connection. In addition, using a local client may be faster than using an online service and you are always in control of the data. We start with the requirements that all RSS readers need to match first. The program has to be compatible with all recent 32-bit and 64-bit versions of Windows. 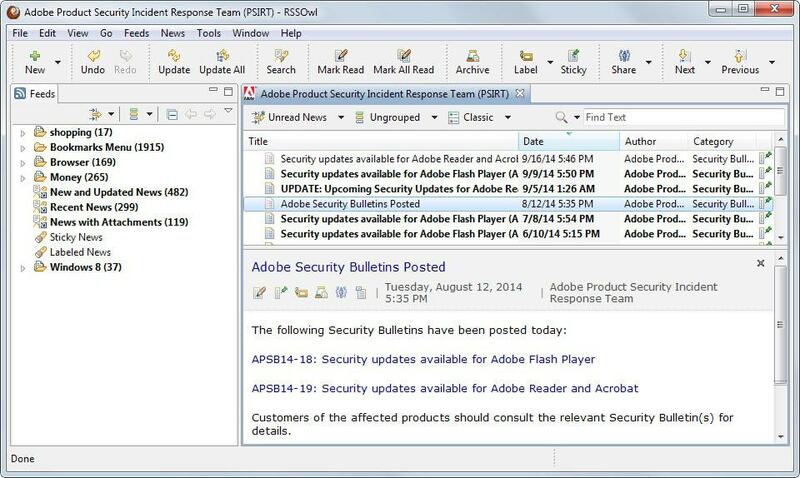 The main feature of the program needs to be RSS reading. All readers listed below support the following set of features: import OPML files and notifications. 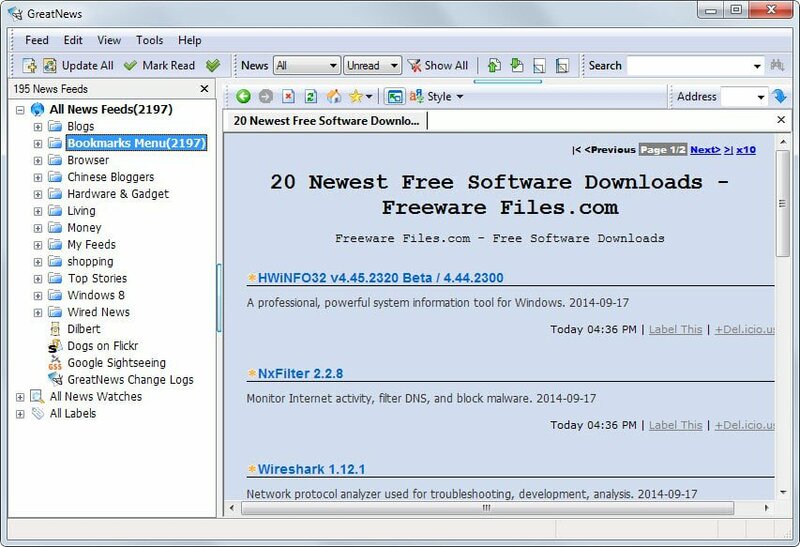 FeedDemon is a long standing client for Windows. You can import an OPML file on start into the client or add individual RSS feeds manually to it. All feeds can be sorted into folders or tagged to improve the manageability of feeds. Unlike other programs of its kind, FeedDemon embeds the contents in its interface which seems to take a bit longer and may pose more security risks than delivering a custom version of the page that is only displaying contents. Powerful filters can be created which list items based on keywords being included or not included in articles. It is possible to add one or multiple keywords and define exactly where FeedDemon should search for those keywords. 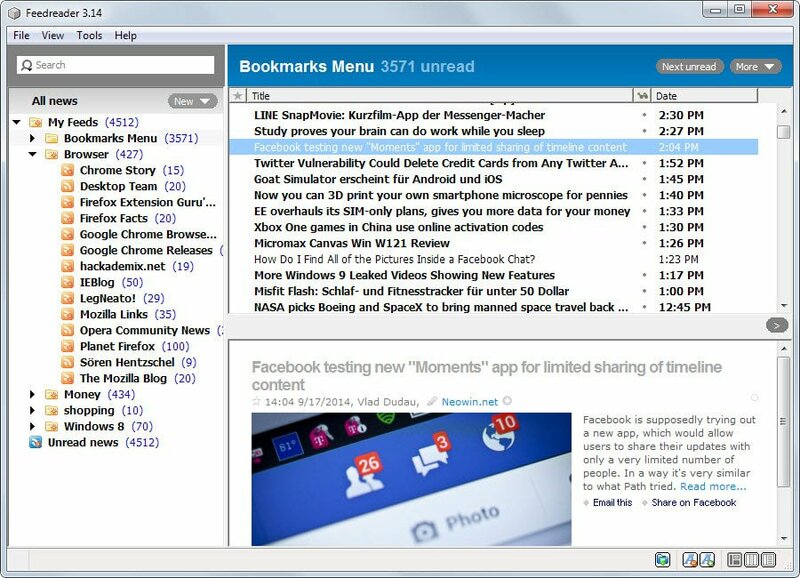 Feedreader has been one of the first desktop feed readers dating back as early as 2001. The program allows you to import an OPML feed or add individual feeds to it instead. All feeds can be sorted into folders and tagged individually. 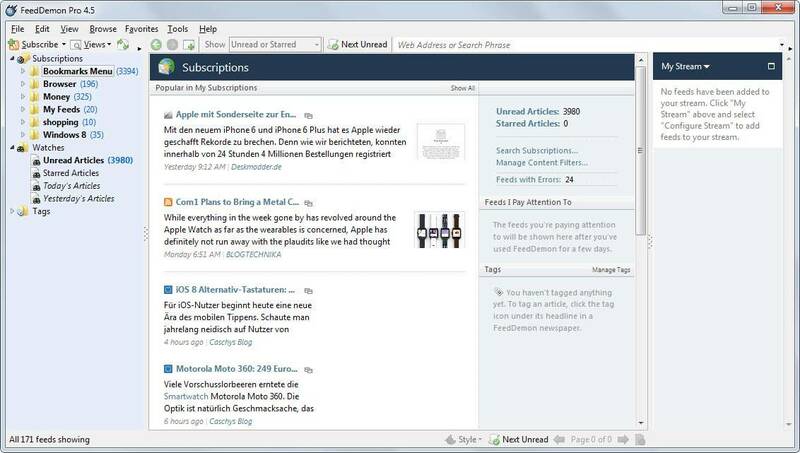 Feedreader displays notifications automatically when new items are discovered and these items can be read directly in the program interface or in an external browser. FTP server or local file synchronization is supported by the application. 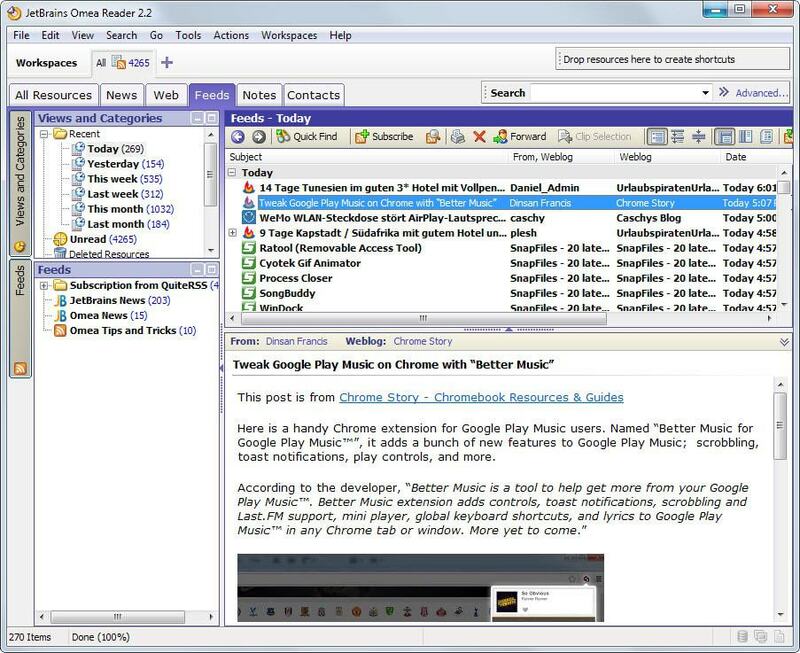 It ships with a small amount of other features of interest, for instance its enclosure browser which can be used to browse media directly embedded in feeds or the option to preload feeds. Overall though, its features are straightforward. The program seems to have been abandoned by its author. While that appears to be the case, it is working fine at the time of writing. It displays the feed listing on the left and the actual contents on the right. Here you can select from different styles that define how contents are displayed on the screen. The program lacks options to display individual feeds in a compact manner on the screen. The closest style available is called brief but it displays entries in two columns instead of just one. The light version of Omea Pro supports most of the features that you expect from a reader. It can import one or multiple OPML files, offers customizations to display news the way you want, and ships with a powerful search and filter engine as well. On top of that, it can be used to browse bookmarked web pages, subscribe to newsgroups or manage podcasts that you are subscribed to. Another interesting feature is the ability to create clippings that the program stores for you and a note taking module to take notes of your own in the program. 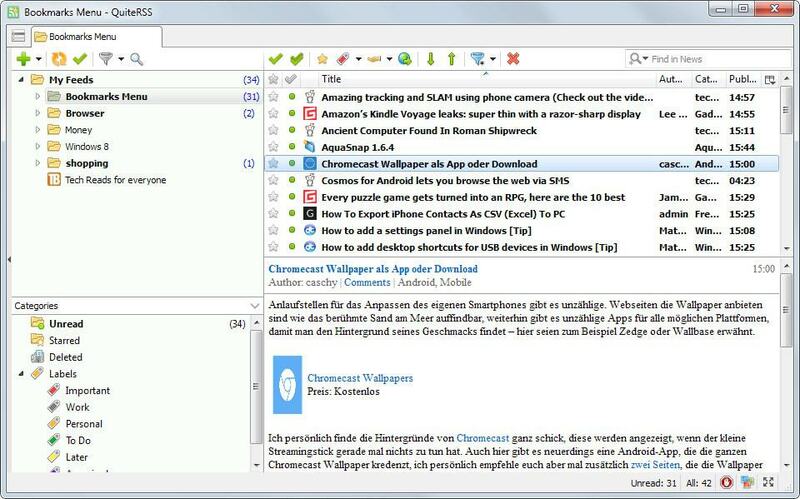 QuiteRSS is a full blown RSS reader for Windows that is in active development. The program ships with all the bells and whistles you'd except it to. You can import individual feeds or OPML files, define how and when feeds are updated, use filters or notifications, and customize how contents are displayed to you. What makes QuiteRSS attractive is the impressive set of features that it offers and the fact that it works fine out of the box. While you can customize the program to your liking, for instance by configuring it to automatically clean the database and old entries on exit or modifying font styles, it is not mandatory to do so. Many users will however appreciate that options are provided to do so. RSSBandit development seems to have stopped in 2013 and while most program features work as advertised, some show the age of time. There is for instance still an option to synchronize feeds with Google Reader, Google's online service that the company retired in mid 2013. The functionality that RSSBandit provides is for the most part quite good. 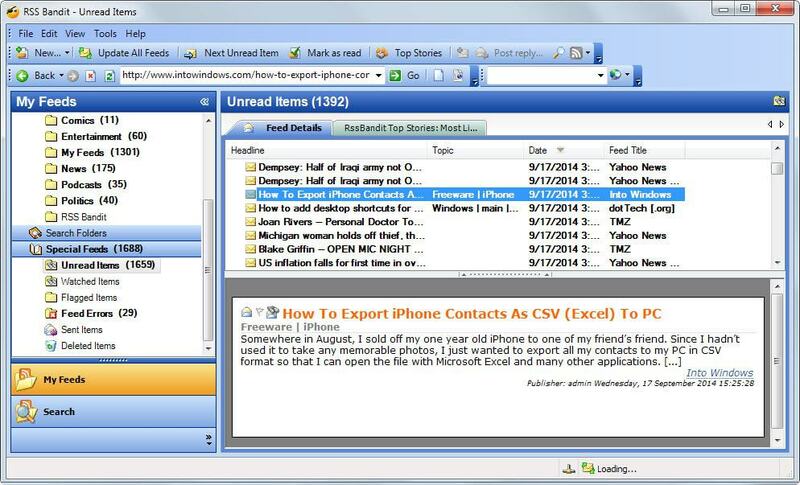 You can import individual feeds or OPML files into the program, customize how contents are displayed in it, subscribe to newsgroups and make use of the top stories feature which tries to determine the most popular stories so that you can concentrate your attention on those. You will notice however that the internal browser is not the fastest, especially when you compare it to other programs listed on this page. RSSOwl requires the Java Runtime Environment so make sure it is installed on the system before you start the application. Feeds can be loaded using OPML files or individually into the program. The default layout displays folders and feeds in a sidebar on the left, the selected folder or feed on the right, and the selected post underneath it. How things are displayed can be modified in the options. Here you can also use the password manager, a feature missing from other applications of its kind, to save login information for sites that require authentication. Other options provided are to configure the notifier in detail, define if an embedded or external browser should be used to display contents, and configure shortcut keys for fast access to program features. The feed reader that I favor right now is QuiteRSS. It has been the main feed reader on my Windows system for quite a while. What I like about it is that it offers everything that I require. This includes a great interface that lets me browse feeds fast as well as excellent filter and search options. It gets my vote but may be too barebones for some. If you require synchronization, you may want to pick another client supporting that for instance.